I think people lament too much about email. The reality is that for many of us, email is our work. It’s easy. Everyone knows how to manage their own email without learning a new system. It’s how information moves to action. It’s not going away and my encouragement is that you embrace it and become good at email. Have a growth mindset. Use it effectively so you can improve your results. 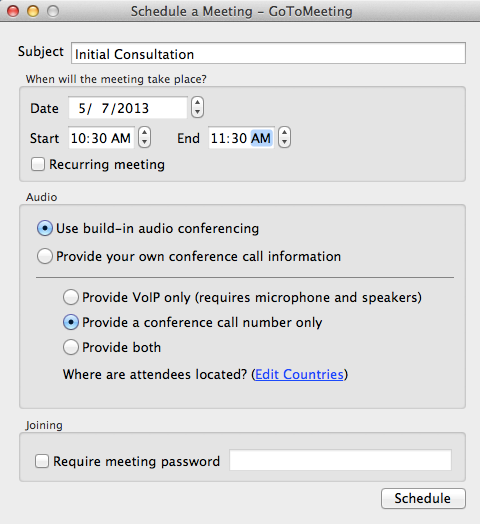 Summarize meetings: Take your notes and any actions and send a summary email right after your calls or meetings. You now have a record and it’s extremely easy to reference any decisions or actions. No CRM required. Check your grammar and spelling: We have these tools built in now. A misspelling simply distracts the recipient and lowers your brand in their mind. Show you care and do a quick check before sending. Use lists: I like numbered lists for any actions or decisions. Make it clear about what happens next. Lead. Clarify. Act. Get to a ZeroInbox. This is not hard. It’s a habit. Most of what you read is informational. Archive those emails. Move others to a folder that need an action or response. Be fast. Yes, you can increase your speed. You have to embrace decision making and action. Be a person known for action. The world responds to action. You have to want to be fast and decisive first, however. Hiding or accepting slowness doesn’t cut it in our hyper-competitive world of choices. We can choose to work with people that are efficient too easily, otherwise. There’s definitely more, but some habits and a commitment to being excellent keeps you in the game, especially in the tool most of us are spending our time in on any given workday. Do you want to become better with better results in email? It’s Friday and most of the world is checking out. These days, with the connected economy, it’s not much of a work day. Make a list of people you want to connect with next week. See my advice on Starring Contacts. Schedule calls using your calendar. Here’s the best practices on being a leader with your calendar. Your invitees will react with a yes or a no. Move the invitation to another time if need be. Weeks simply keep going by relentlessly. This is a little hack so you can get a little control and make your time align with your goals. It’s about getting results. How about checking in with your network before checking out for the weekend? Paying bills can be a drag. They are the nuisance of our modern existence in many ways. Miss a bill and it can create some angst and hits to your credit. Well, I like simple and powerful systems for doing business and life. I work with clients all the time on streamlining processes. You can adapt a system like Google Apps in many different applications. And the great thing is that it is integrated and you don’t have to leave the ecosystem. Here’s a great way to set up your bill management. 1. First ensure that all your bills come to you by email. This way you have it electronically and it becomes searchable. 3. Add all your bills as task items. Put in the amount, description and due date. You click the little arrow to the right of the task when floating your mouse over to add more details. You can pick the due date this way. 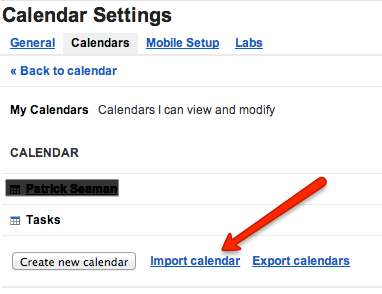 Anything with a due date ends up in your Google Calendar. Make the due date match the statement. 4. 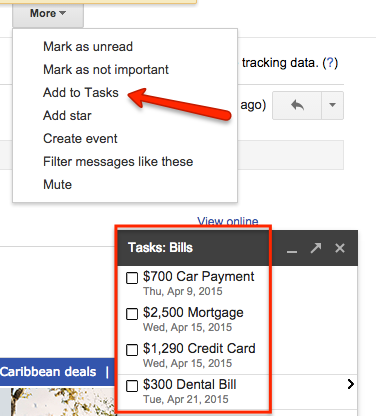 If you get bills within your email, use the Add to Tasks function in the More picklist when in your email. This converts the email to a task and the Related Email is captured inside the details of the task for your reference. You can always click this later if you need to see it. 5. Reorder your list by due dates. You can grab each task and drag them up and down the list. Keep the list chronological. 6. Check off bills you pay with your online banking or via credit card payments. It’s a simple system. You can also get an app like GoTasks that syncs your iPhone app to your Google Tasks. You can review your list to ensure everything is in order and paid. Anything that is past due will turn read. 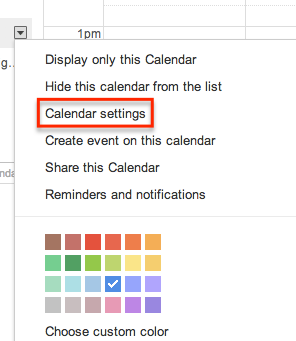 You will also get notifications from Google Calendar for any missed due dates. 1. Sign up for a free Credit Karma account and keep track of your credit scores and history. Avoid any late payments and keep an eye out on your credit history to ensure there are not mistakes. Those give you big hits on your score if you are late. 2. I don’t like automated EFT. It’s a pull from your account. Depend on pushing instead with online bill pay. Better to schedule if you need to. 3. On recurring bills, check off a payment you made and set the next one. It’s good for you to tee up the next 30-45 days this way. 4. See how many bills you can get rid of. It will give you more freedom. Heck, you might even try and get your commitments down to zero. Wouldn’t that be something? It’s an easy system that will allow you to feel more control and manage your bills in an environment you are likely working in every day, your email. You can play a game and see how small you can get your ongoing list and monthly commitments. 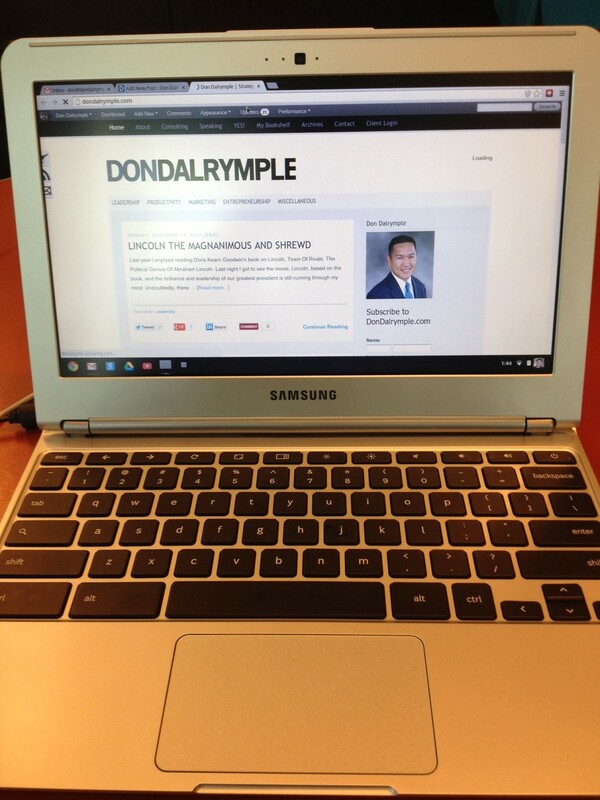 I just got a hold of a cool, light Samsung Google Chromebook. The operating system is Google’s and the concept is centered around Google Apps without any focus on a desktop experience. It is cloud computing purely via an elegant terminal similar to an 11″ MacBook Air. I like the concept. It is light and great for my experience which centers around cloud computing. I spend much of my time collaborating with clients and my team. It boots up quickly and I can get to work without any hindrances to my productivity. Engadget’s review is pretty thorough and for the price point at $249, it is a steal in my mind. If nothing else, it forces a workflow and productivity around the cloud that can help anyone move their habits towards using the internet as the computer. I am going to keep working on it for a while and testing its boundaries. I don’t anticipate doing any heavy lifting, but a lot of my writing, speaking and systems work should be pretty easy to accomplish on this tool. At 2 pounds, it’s a great deal that I am pleased with. If you have any questions, feel free to post, or if you happen to grab one as well, I would like to learn more about your experience. If you have another Google Apps account under a different domain, then you may have migrated email from one Google Apps account to another. However, Google Docs poses another issue altogether. Select all the documents you want to transfer, go to the More Actions drop down from your old account you want to transfer from and click on Export. This will compress all the documents into a zip file and download it to your hard drive. Afterward, you can go to your new Google Drive and hit the Upload button in the top left corner, and choose all the documents you just downloaded. It will take a while depending on the size of your Google Drive. Note that any documents for which you are a collaborator but not the owner will not transfer correctly with either of these methods; you’ll need to contact the owner of those documents and tell them to re-share them with your new account. 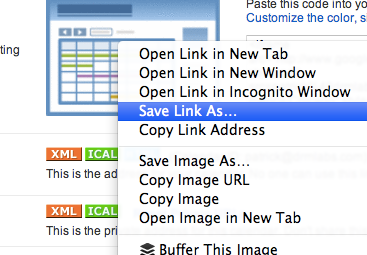 Another option is to download Google Drive for Mac. This is located on the left menu. From there sync your Google Drive locally with your old Google Docs account. After it is complete, disconnect the account and sync it instead with your Google Drive for your new system to sync it up. You will be able to use this system to move documents. Be sure that you review documents that were previously shared with you or that you shared out. These sharing rules have to be reestablished. We support many organizations on their Google Apps systems and provide strategy and consulting to drive productivity, collaboration and business processes. 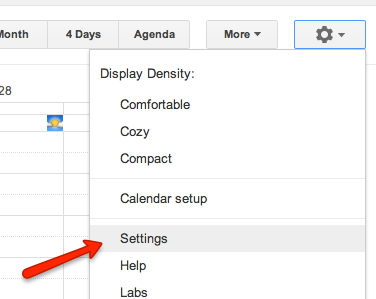 Our own team has been transitioning to Google Drive, Google’s newest addition to the Google Apps suite. 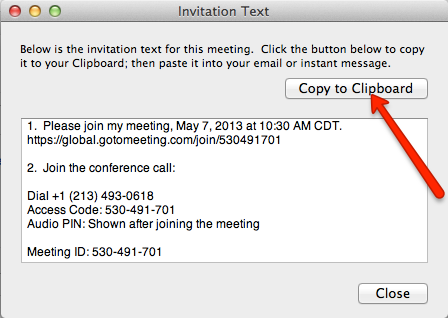 It works a lot like Dropbox, however, there is advantage within the Google Apps suite. You can keep your team tightly integrated within your cloud environment as well as administer the sharing rules of documents. We will be posting our experiences, the strategies we see for our clients and how Google Drive can be used strategically for your teams in the coming weeks. The file synchronization for Mac and PC users is an initial install which allows for sync between your cloud storage and your desktop working files in one place. It’s looking good so far. The test will be in how everyday work gets done and how our team is better able to execute. What has been your experiences so far? You can have a zeroinbox! Move fast! # – This is delete emails. As you move through your email, hit this key much. Most of your email is junk. Learn these three keys. Every email has to have one of these shortcuts applied. If you don’t it’s because you did not make an executive decision. Some of the teams we implement cloud computing systems for work in one location. Many more are distributed and work all over the country and the world. 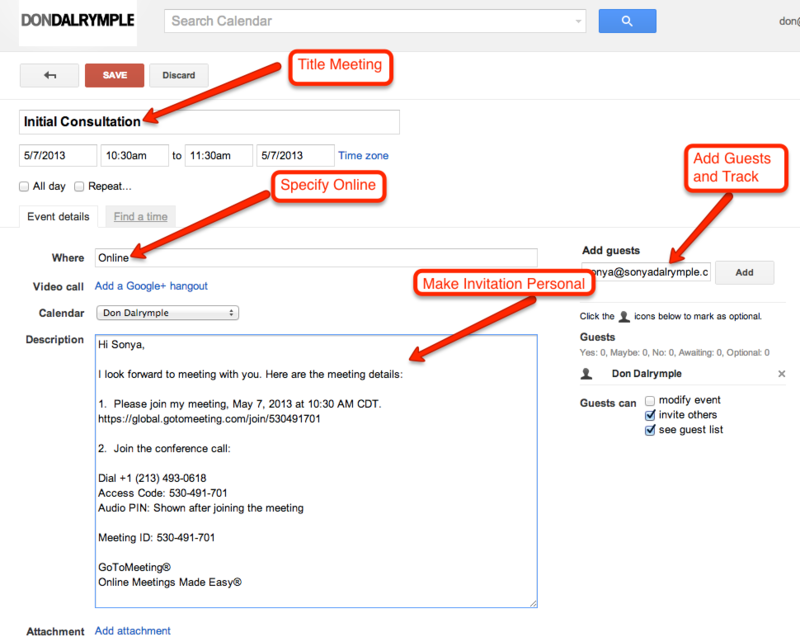 With Google Apps, for example, a team can be in completely different locations and feel together in one environment. Their collaboration is in real-time and everyone can get things done accessing resources and people available in a secure environment. It is the magic of the cloud. You can manage your business and customers from a web browser or mobile device. Your location is much less important in the cloud. The thing that matters is whether you are logged in, and that matters only depending on whether you are working in real-time vs. sequentially. One of our recent implementations of a team has their organization spread halfway around the world between various states and South America. Having a central knowledge base where they can get answers in a Google Site helps everyone to get aligned around business process. As things continually change, the process can be updated, knowledge can be shared easily and systems can be updated to enable customer communications and follow-up for sales, service and marketing functions. Ask someone a simple question, “Where do you go to get things done?” See if they truly answer, “The office.” Most people get distracted in an environment where people can interrupt them and are tempted to do so easily. We get work done through focus and moving information on a screen. Ideally, this is in a central cloud computing system. Perhaps the old ideas and habits keep you from broadening your perspective on what productive organizations are already doing today. How about exploring and use the cloud to lower your real estate footprint, allow people to work from home or work wherever they want. It will force you to make the work about systems rather than face time. How can you apply this to your startup or business?